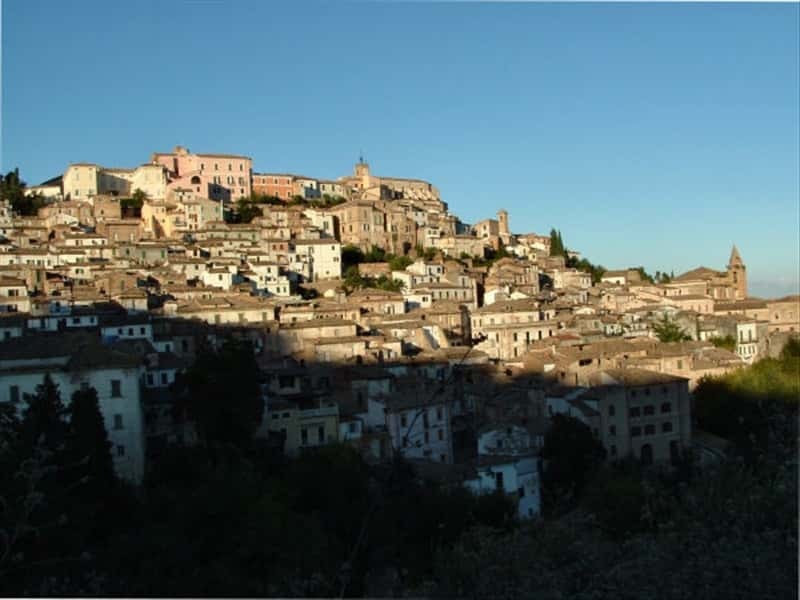 Loreto Aprutino is a town in the province of Pescara, located a short distance from the provincial capital, on a plateau on the left-side of the Valle del Tavo. It proposes typically medieval characteristics, with narrow streets and noble mansions, dominated by the bulk of Castello Chiola and the Church of St. Peter. Originally a village, in the Upper Middle Ages, it became a county with the Normans. Under the Swabian and Angevin rule, it became a possession of various feudal Lords, including the d'Avino, the D'Affitto, the Caracciolo and the d'Avalos. - Castello Chiola, originally built in the XI century, was the scene of clashes between Angevin and Aragonese in the XV century. Over the centuries it has undergone many alterations and refurbishments by the various feudal families that lived here. - the Church of St. Peter the Apostle, preceded by a XVI century portico adorned with three-light windows and coats of arms of the local Bishops and Lords. To the essential lines of the door in Renaissance style, oppose the scrolls and decorative Baroque interior with one major nave and two aisles, expanded in each direction with side chapels, rich in frescoes and ceramic floors. - the Museum Acerbo of Ceramics of the Castles, whose collection, exhibited in the halls designed by Leonardo Palladini, consists of 570 pieces and is the most consistent and complete collection of fine art pottery. This town web page has been visited 31,009 times.